It’s been awhile, but I have another great cookbook for you! If summer = grilling for you, then I think I’ve found your new favorite cookbook. It’s not uncommon for us to grill almost every day of the week this time of year. Sometimes we get in a bit of a grilling rut, especially when it comes to chicken. I find myself prepping the same handful of recipes on a regular basis. Now I have a new one to add to the rotation, grilled monterey chicken! This is just one of the many that I have marked to try from America’s Test Kitchen’s new book, Master of the Grill. (Don’t miss the opportunity at a chance to win a copy for yourself at the bottom of this post!) From beginner to advanced, this cookbook has recipes for every skill level. You’ll also find regional favorites that you can now replicate at home! Along with great recipes, the cookbook also features ingredients tips, grilling utensil ratings, prepping tips, grill hacks, and, my favorite, the science behind why the recipe works. I know I’ve said it before, but I’ll say it again, knowing why a recipe works is so helpful! Not only does the information help you with the recipe you’re working on, but it can also help you with other recipes that are similar. Another helpful section in the cookbook, is how to set up the fire in your grill. Heat is obviously very important in grilling, and this section shows you how to set up your charcoal for different heating levels for a charcoal grill and how to set the burners on a gas grill! Super helpful! After looking through the cookbook, and marking a bunch of recipes to try, I handed it over to my husband. He’s the master griller at our house and would be making the recipe, so I figured I should let him have a say in what he makes! He had a hard time choosing just one recipe, too, but we eventually settled on this monterey chicken complete with a fresh pico de gallo! 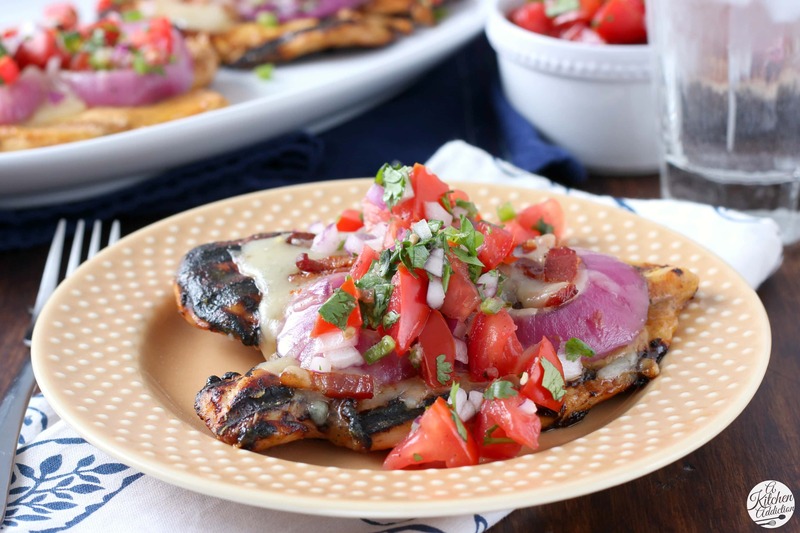 With minimal prep work, just a handful of ingredients, and clear, easy-to-follow instructions, this grilled monterey chicken turned out juicy and loaded with flavor. Grilled onions basted with bacon fat top the honey Dijon marinated chicken. A combination of pepper jack cheese and bacon is melted over the top. And, lastly, a fresh (and super easy) pico de gallo is spread on top right before serving. 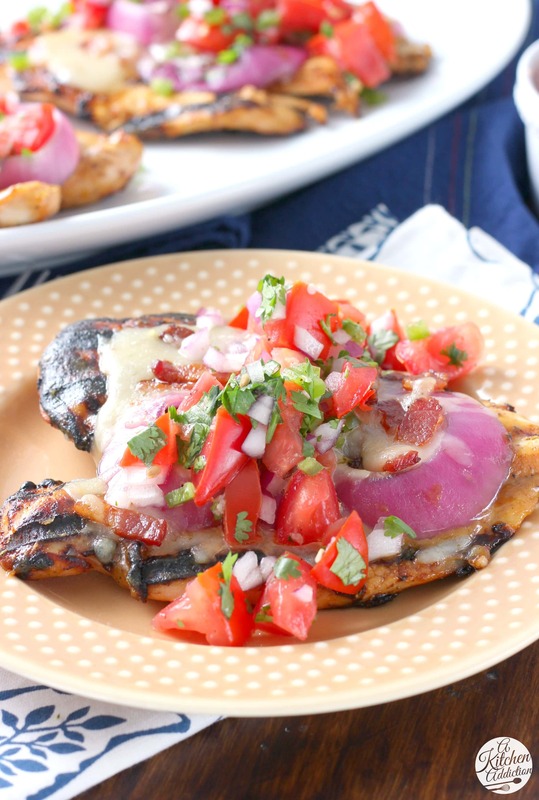 No more boring grilled chicken here! Want a chance to win this cookbook for yourself? Simply leave a comment below telling me what your favorite food is to grill! That’s it. Good luck! Whisk mustard, honey, salt and pepper together in bowl. Reserve ¼ cup honey-mustard mixture for basting chicken. Transfer remaining honey-mustard mixture to 1-gallon zipper-lock bag. Working with one chicken breast at a time, starting on the thick side, cut chicken in half horizontally. Stop ½ inch from edge so halves remain attached. Open up breast like book, creating a single flat piece. Place chicken in bag with honey-mustard mixture. Toss to coat, and refrigerate for 30 minutes to 1 hour. Meanwhile, cook bacon in 10-inch skillet over medium heat until crisp, about 5-7 minutes. Using a slotted spoon, transfer bacon to paper towel-lined plate. Reserve bacon fat. Once cool, toss bacon with pepper jack. Open bottom vent completely. Light large chimney starter filled with charcoal briquettes (6 quarts). When top coals are partially covered with ash, pour two-thirds evenly over half of grilled, then pour remaining coals over other half of grill. Set cooking grate in place, cover, and open lid vent completely. Heat grill until hot, about 5 minutes. Turn all burners to high, cover, and heat grill until hot, about 15 minutes. Leave primary burner on high and turn other burners to medium. Clean and oil cooking grate. Push toothpick horizontally through each onion slice to keep rings intact while grilling. Brush onion slices lightly with reserved bacon fat and place on cooler side of grill. Place chicken on hotter side of grill, cover, and cook until lightly charred, about 5 minutes. Flip onion slices and chicken. Brush chicken with reserved honey-mustard mixture, cover and cook until lightly charred on second side, about 5 minutes. Remove onion slices from grill and move chicken to cooler side of grill. Quickly remove toothpicks and separate onion rings. Divide onion rings evenly among chicken breasts. Divide bacon-pepper jack mixture evenly over onion rings. Cover and cook until pepper jack is melted and chicken registers 160 degree, about 2 minutes. Transfer chicken to platter, tent with aluminum foil, and let rest for 5 to 10 minutes. Toss tomatoes with ¼ teaspoon salt in bowl. Transfer to colander and let drain for 30 minutes. Combine drained tomatoes, onion, cilantro, jalapeno, lime juice, and garlic in bowl. Season with salt and pepper to taste. This recipe is used with permission from America’s Test Kitchen: Master Of The Grill. Disclaimer: I received a copy of America’s Test Kitchen: Master Of The Grill for review purposes. Giveaway is sponsored by America’s Test Kitchen and is open to US residents 18 years of age and older. corn! all of the corn! That chicken looks amazing! 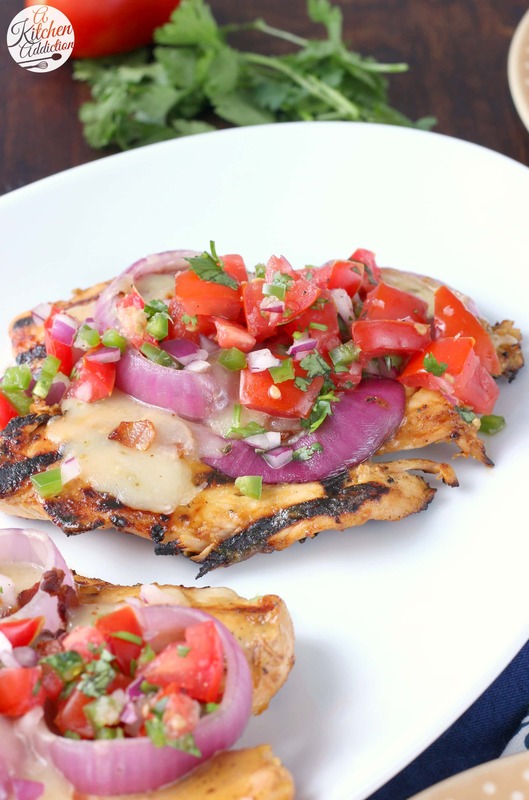 Monterey chicken is one my husband’s favorite dish to order when we eat out at Chili’s. I will have to try this one at home for him! I love to grill salmon and gourmet turkey burgers (spinach and feta, italian, stuffed). This recipe looks so tasty! It looks like it is full of flavor. Love all grilled foods, but especially fish and shrimp as a go to favorite! That looks great! We love BBQ pork steaks and fresh corn on the cob on the grill. Romaine lettuce (I’m a vegetarian) makes a great salad! I love salmon and pork tenderloin! I love salmon, and pork tenderloin! I love to grill veggie skewers. This chicken looks amazing! And I already have almost all the ingredients. This looks so delicious and packed with flavor! Need to have this for dinner soon! A hamburger will always be my fave thing on the grill! I just built a fire in my back yard fire pit and roasted some corn-on-the-cob. It was amazing! I’m excited to check this book out – I’d love to learn more about grilling! My family loves to grill hamburgers and hot dogs! Grilled corn is the best. We have also been doing lots of pizza. So good! This chicken looks amazing — I love all those toppings! Grilling is one of my favorite things about summer! I love to grill chicken ! Since Chicken is about all that we eat that would be my favorite thing to cook. I will throw on veggies and possibly fruits to finish off that meal. Now I’ve made myself hungry I need to start prepping for this evenings meal. I love to grill pizza! This chicken looks fantastic. 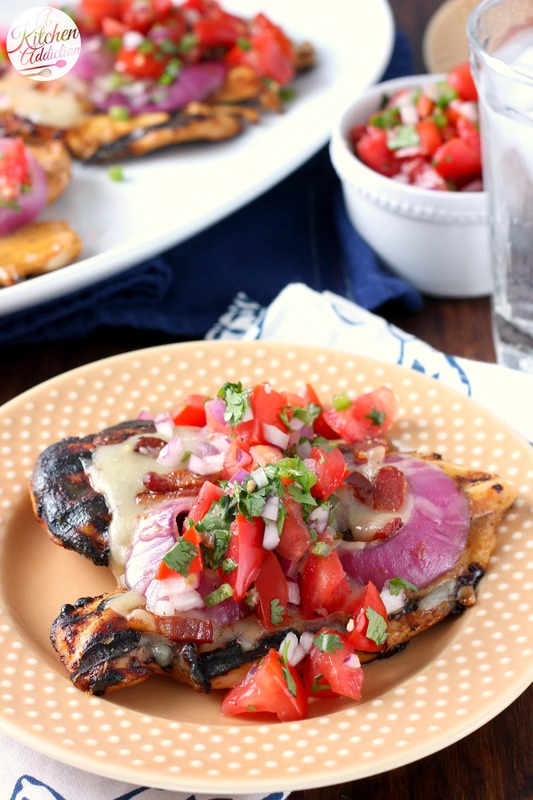 We pretty much live on grilled food in the summer, will definitely be giving this a try! My freezer is full of chicken! This would be a fabulous addition to our menu! I need this book! I don’t experiment much on the grill but it’s so nice to have some new options to last throughout the summer! I love to grill steak-flank steak, filet, T-bones, you name it! Sounds like a fun cookbook! I like grilling stone fruit or pineapple! Love the minimal prep work and of corse all the ingredients…simple scrumptious! Looks good and like something the whole family would enjoy. I’ll have to keep this in mind as a new dish to try for dinner. Whatever is close at hand. I grill whenever possible. grilling is my preferred method of cooking. use it always for whatever is grill able. always happy to find new recipes. Meat. I love grilling meat. Especially beef and chicken. Omg! That looks so good! I love to grill steaks! Grilled pineapple! I brush it with a cinnamon-honey mixture and it’s the perfect dessert in the summer! I just grilled romaine lettuce and topped it with corn and a blue cheese dressing. Loving summer! It may sound silly, but I LOVE grilled onions, so good drizzled with baksamic vinegar! Asparagus with olive oil, salt, freshly-cracked pepper, and minced garlic.